This is an article intending to teach you certain terms that will help if you are investing in, or selling gold and precious metals. When entering the world of precious metals, its important to know the meanings of key terms you may hear often. Below are 15of those terms and their definitions. For the sake of simplicity, gold in any of the definitions below can be replaced with silver, platinum, or palladium. 1. Ingot – Ingot and bar may be used interchangeably in regards to precious metals. A mass of metal formed into a convenient shape for shipping, storing, or further processing. 2. Bullion – Precious metals in the form of bars, coins, or other ingots. 3. Circulated/Uncirculated – Circulated coins have been used as currency by the public, and uncirculated coins have not. Uncirculated coins are usually in much better condition than circulated ones. 6. Spot price – A precious metal’s live trading price. Determined by the price of the metal’s most heavily traded futures contract at the time. Gold at spot price is referred to as spot gold. 7. Fineness/Purity – Fineness, or purity, represents the amount or percentage of gold contained in a particular piece. 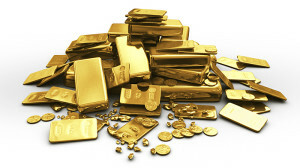 Most often expressed as a decimal (0.999 pure gold) or percentage (99.90% pure gold). Example: The Canadian Gold Maple Leaf coin has a fineness of 0.9999, meaning it contains 99.99% pure gold. 8. Karat – Another expression of the purity of a precious metal. Using a gold coin as an example, to calculate karats, the mass of pure gold in the coin is multiplied by 24 then divided by the total mass of the coin. One karat represents 1/24 of the whole, so a 22-karat gold coin is 22 parts gold and 2 parts base metals or impurities. 24-karat gold is “pure gold”. 9. Assay – Assessment of the contents and quality of a precious metal product. A coin or bar that has been assayed is guaranteed to contain the amount and purity of metal indicated. 11. Premium – Dollar amount or percentage that a coin or bar sells for over its melt value. 12. Spread – Difference between the selling price (ask) and buying price (bid/buyback price) of a precious metal coin, bar, or other trading unit. May be expressed as a dollar amount or percentage. Spread (percentage) = (Ask & Bid) / Ask Example: A coin with an ask price of $1,000 and a bid price of $800 has a spread of $200 or 20%. 13. Liquidity – The ease with which a certain coin or bar can be bought and sold. 1-oz. American Silver Eagle coins have high liquidity as they have a large, active base of buyers and sellers. 14. Mint – Facility at which precious metal coins or bars are produced. The United States Mint produces coins at the Philadelphia Mint, the Denver Mint, the San Francisco Mint, and the West Point Mint. 15. Numismatics – The study or collection of physical currency. A person who collects or studies coins or other forms of currency is called a numismatist. Coins such as the Saint-Gaudens Double Eagle and the Peace Silver Dollar are popular among numismatists. now i’ll sound intelligent when i go into the store for the first time! thank you for sharing this content. i found it very valuable.